20 June 2017. The U.S. Food and Drug Administration approved a new drug that treats serious bacterial skin infections, including those often resistant to current antibiotics. FDA yesterday informed Melinta Therapeutics in New Haven, Connecticut that its drug delafloxacin, marketed as Baxdela, is approved for acute bacterial skin and skin structure infections, including those caused by methicillin-resistant Staphylococcus aureus or MRSA. New antibiotics are needed to address a continuing problem of bacteria that evolve to resist current antibiotic drugs. Centers for Disease Control and Prevention says each year some 2 million people in the U.S. develop infections resistant to antibiotics, resulting in at least 23,000 deaths. 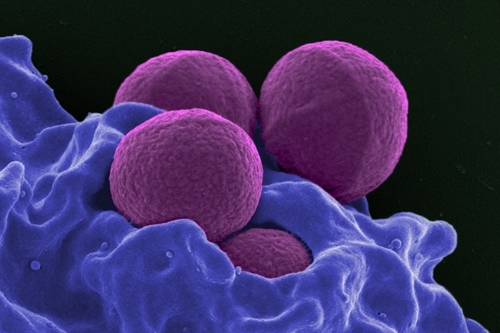 Among the more troublesome infections are those caused by MRSA, often found in health care facilities that result in pneumonia, blood stream, and surgical site infections. Baxdela is in a class of antibiotics known as fluoroquinolones that counteract enzymes needed for bacteria to replicate. The drug is given in tablet form or as an intravenous infusion. FDA approved Baxdela for infections caused by gram-positive bacteria — MRSA and other Staphylococcus as well as some Streptococcus microbes — and gram-negative bacteria including Escherichia coli, Enterobacter cloacae, Klebsiella pneumoniae, and Pseudomonas aeruginosa. “Gram” refers to a classification for bacteria where the microbes either retain (gram-positive) or shed (gram-negative) a test stain on their protective cell coatings. Melinta says FDA approved Baxdela based on results from 2 late-stage clinical trials showing the drug as effective against acute bacterial skin and skin structure infections as combinations of current antibiotics vancomycin and aztreonam in generating a response within 72 hours. The company reports less than 1 percent of individuals in clinical trials discontinued their participation due to adverse effects. Nor were adverse effects reported for heart rhythm disorders, liver or kidney function, glucose regulation, or skin irritations. However, other fluoroquinolones are associated with tendinitis and tendon ruptures, peripheral nerve damage, and central nervous system effects. FDA is requiring label warnings about these potential adverse effects and a recommendation against its use in people with the neurological disorder myasthenia gravis, where the drug may exacerbate muscle weakness. Baxdela was reviewed by FDA under its Qualified Infectious Disease Product program that expedites the agency’s evaluation for new drugs addressing antibiotic resistance. That program was created by the Generating Antibiotics Incentives Now Act signed into law in July 2012.